It turns out that 5.1 million people search for QR Codes information, products and services on a monthly basis. This is much more traffic than I would have guessed. 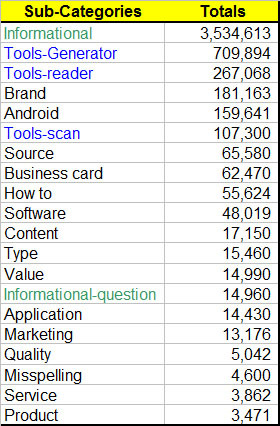 In fact when I classified the QR Code keyword phrases to user intent I found that there are 17 distinct categories of behavior in the QR code AdWords data set. Some of the categories are interesting. For example, there is significant traffic for QR Codes around Android. In fact Android has 50% more traffic than Microsoft Tags. See the comparison at the end of this article. When you look at sub-categories you often see what is most important to consumers. For example, when you look at Tools category, consumers by a two to one margin are much more interested in QR code generators then QR code readers. Let’s take a look at these categories in a little more detail. Informational: with 3.5 million searches, the informational category is the largest. Many of these keyword phrases are high level, and vague in intent. Where there is intent you see them searching for uses, images, specifications and standards. 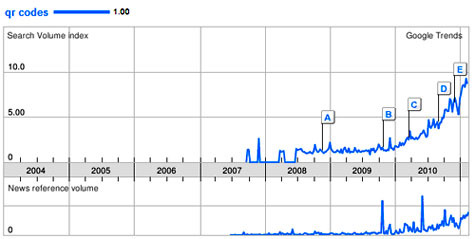 You also see 15,000 searches a month asking the question “what is a QR code“. The other trend worth noting here is that the term bar code appears 1.9 million searches each month. QR code readers: a little over 75% of these queries include the term reader. The remaining traffic has the terms translator, converter and decoder that indicates they are looking for a reader. You also see other modifying terms that you don’t see in the generator group – such as: online, mobile, download and PC. QR code scanners: 75% of the time consumers use the word scanner in the remaining instances they use the term scan. Source: 34.5K searches a month are consumers looking for an online source to download an unspecified QR Code related item. It could be a reader, generator or source code –it’s hard to tell. Business cards: The interest in adding QR Codes to business cards is the single largest request in the content category – you see 61.4K searches a month. How to: There are 55.6K searches a month associated with how to deal with a QR Code in three distinct ways. Creating is the dominant term in this category. Content: The remaining content searches are for examples, logos and VCards. There are 15.7K searches for this type of content. Software: In this category people are looking for software, but they are not specifying any particular application. They are specifying platforms such as Window Mobile and J2me. When they search for software by language, PHP is the most common followed by C#. The third most common group are searches for SDK’s and API’s. There are 44.1K searches a month for software. Value: There is only one term used to specify a value, and that is the term “free.” There are 14.9K searches for a source of free readers and generators. Applications: There are 14.4 monthly searches where consumers specify they are looking for an application by using apps, analytics or tracking. When they use the term Apps it’s hard to tell if they are looking for a generator or a reader. Marketing: Here business people are looking for QR Code information within the context of Marketing, Advertising and Campaigns. There is also interest in using QR Codes in Games. There are 13.1 searches a month in this group. Quality: There is not a lot of traffic here – just 3.5K searches each month. The most common qualities they are looking for are designer, custom, color and cool QR Codes. Misspellings: This search traffic is a reflection of people new to 2D Bar Codes, and they just can’t remember the correct term. Service: There are 3.8 monthly service-related searches, mostly for designing QR Codes, or printing them. This category should be viewed as transactional. Product: With 3.5K searches a month these consumers are mostly searching for QR Code T-Shirts, followed by interest in Stickers and Tattoos. When I initially looked at the two AdWords data sets, QR Codes and Microsoft Tags, I saw that QR Code keywords had double the traffic of Microsoft Tags. I was not surprised since QR Codes have been around a long time. Based on the hype I’ve read lately about Microsoft’s success in lining up all kinds of publishing firmsbehind their technology, you would think that there would be a ground swell of search activity for Microsoft Tags. QR Codes: 5,155,463 monthly searches. Microsoft Codes: 2,296,765 monthly searches. However, when I dug into the Microsoft Tags data I was shocked to find that 95% of the keyword phrases were QR Code related. 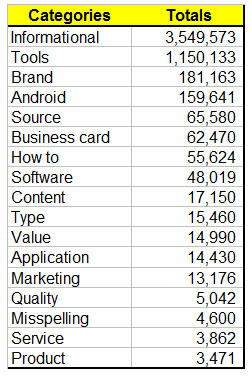 Just 116K searches a month had the terms Microsoft Tags in the keyword phrase. Also, there were just 1.2K Microsoft Tags related phrases in the QR Code data set. With 117K searches a month for Microsoft Tags it appears that Microsoft’s Tag technology may be a single-industry success story. The data also suggest that Google has much more traction in the QR Code community than they get credit for. One thing is clear; Microsoft is doing a better job of PR than all the other firms in the QR Code community. For an in-depth comparison of QR Codes to Microsoft Tags check out my article at Search Engine Land.